I think the cramped fingers caused me to loosen the tension as I worked on the last 40% or so of the towel, because the gauge got noticeably (to me) looser towards the end. 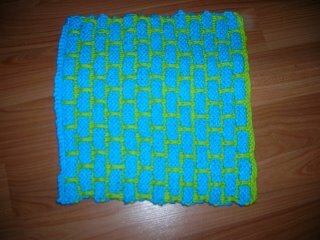 So the towel ended up being a sort of trapezoidal shape rather than the desired rectangular shape. But I dampened and blocked it (more like forced it into a rectangle) - so far, so good. I can definitely say that the towel is, indeed, absorbant (a rather important quality in a towel). 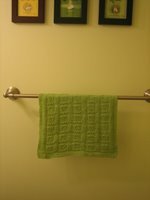 I hope the towel doesn't become horribly misshapen with use, but for the moment, it looks pretty good hanging on the towel rack in the guest bathroom, and my mom is thrilled with the finished product (in fact, she's experiencing some of that "precious knits" syndrome and refuses to do more than touch it gingerly with her fingertips). 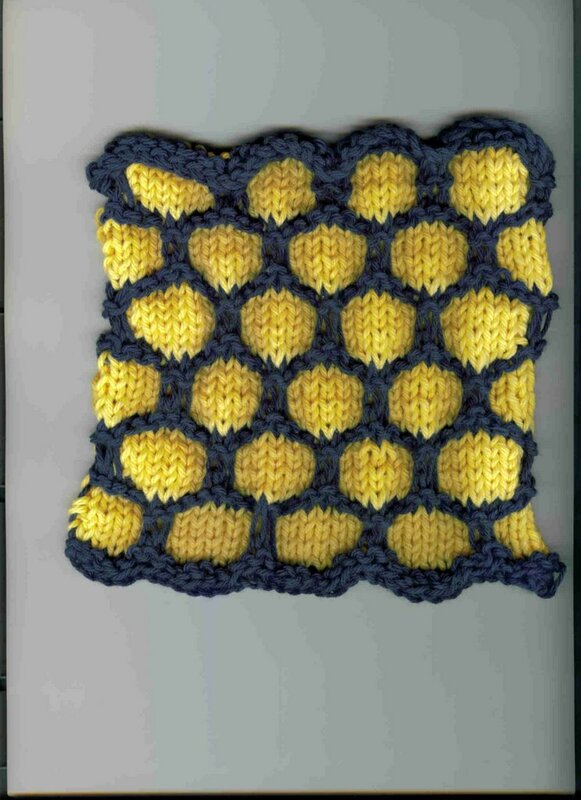 I may go ahead and attempt the chevron hand towel in the cotton crochet thread, possibly in a navy blue and gold color scheme (gift-appropriate for the parents of an Annapolis grad). Any suggestions, comments, etc with regard to the pattern? The patterns from this book are so much fun. Since adding it to my library I have been making dishcloths in every spare minute. 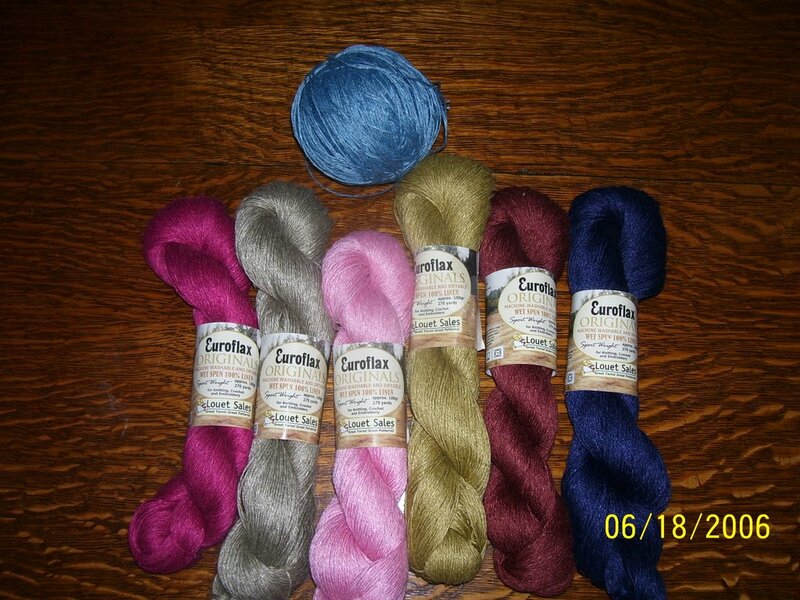 Seeing what others are soing has inspired me to be a bit more adventurous in making color choices. 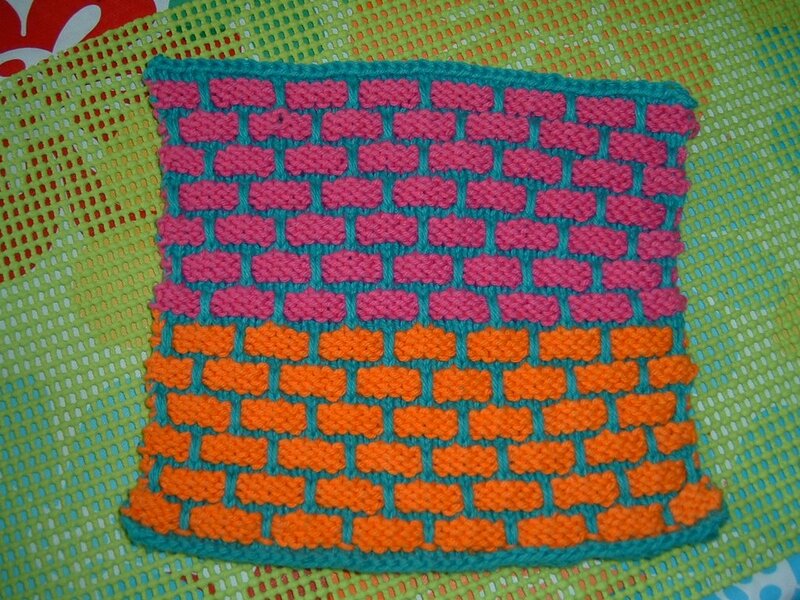 I made this one using the Big Dotty pattern. It is small so it fits my hand easily. I signed up awhile ago but with all the stuff i was making i just didn't have the time to make anything from the MDK book. 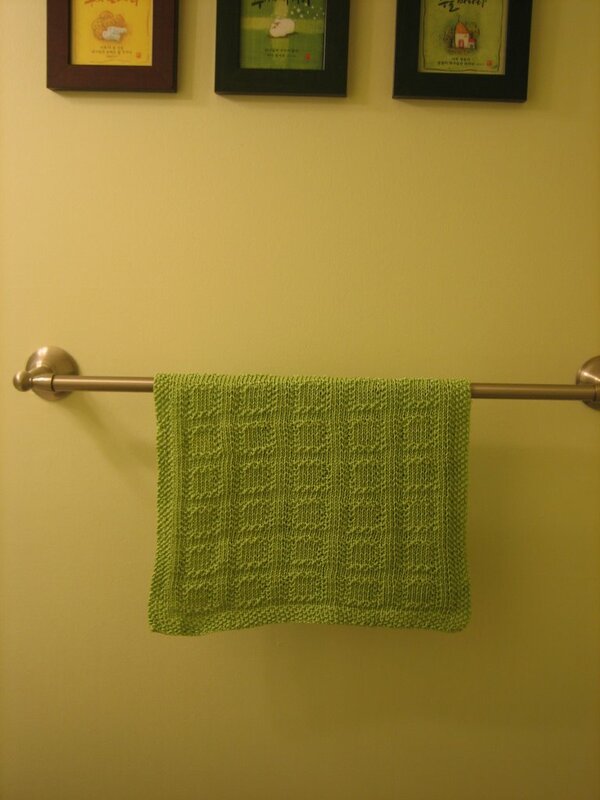 BUT FINALLY here is something...a washcloth(with 2 boo-boos-Can you see them?) :) but i love how it turned out. 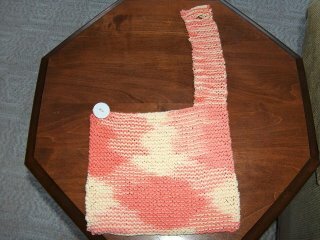 I made it with the Peaches and Creme yarn. I really want to try a log cabin next but don't have much yarn that is similar enough to do it and trying to save some cash right now. But i love seeing what everyone else has been up to. You are all super inspirational! 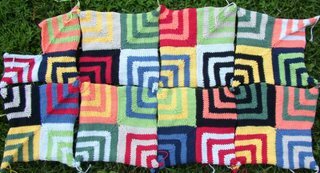 OK, y'all, seven squares done, number eight in progress. 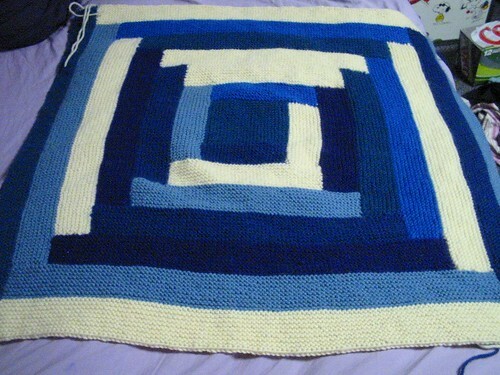 If I don't lose my bloomin' mind, I should be ready to start joining my blankie together by the end of next week. Which brings me to my question for you: which square arrangement should I use? Photo #1 shows the squares all facing the same direction with the dark corner left and down and the light corner right and up. Very uniform, but maybe a little dull? 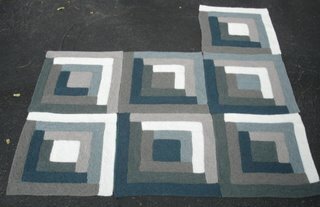 Photo #2 shows the squares so that 4 dark or light corners are placed together to form diamonds within the larger square. (Can you see the diamonds? Squint a little.) This configuration looks more exciting to me, but it seems to be impossible to avoid having same color strips touching. Should I let that bother me? HELP!! I have finished (almost) a mitered square for the project. 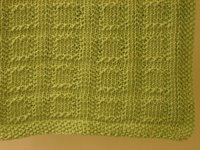 I finished the pattern - row 47 S1, k2tog, psso...then it says fasten off remaining stitch....yet I have 3 stitches left.... I went back and redid everything from row 43 and I don't know what to do. And I have this loopy thing on the back from S1 (I'm guessing). Other than that, it looks great. I am very proud of myself. I'll post a picture later. Wow! i loved it! 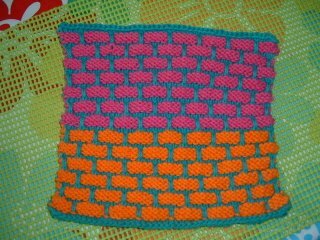 i love the pattern...it was so much fun and so easy. 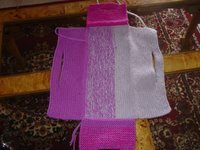 i am in the middle of a relatively large project (a prayer shawl) and needed a break. this was a great diversion from the prayer shawl monotony. i am in love with the patterns in this book. they have inspired me to purchase WAY too much cotton during the Hobby Lobby 0.99 sale! i think the color combinations are endless and gorgeous! thank you all for sharing your projects! they are so inspiring. i am coveting the log cabins and trying to plan one of my own! we'll see...i will keep you all posted. Next on the needles: a short-sleeved baby kimono!! Warshrag! I love the turquoise. The next picture is a baby kimono for a coworker of my moms. The mother to be says it will be the baby's coming home outfit. Guess she likes it! Pamela, Are you out there???? 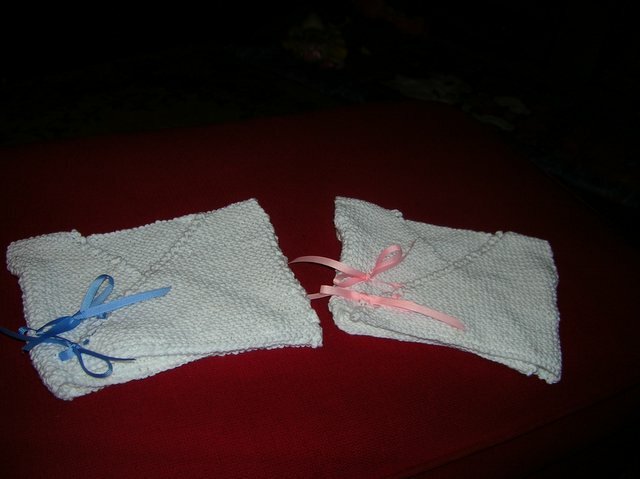 You had a post awhile back about finding your Grandmother's washcloth. 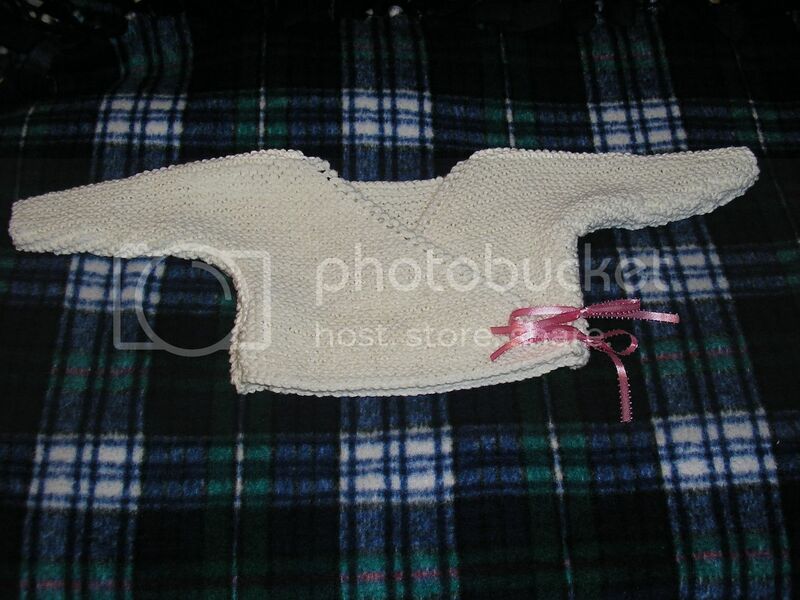 I was telling you about how my Great Grandmother used to make knitted slippers for my sister and I. You said that you had a pattern for them if I wanted it. I would love to have it if you have the time to send it. I lost the thread to the posts because I was away and thought this might be the best way to get in touch with you. When I told my sister about it, she got all teary and asked me for a set for her and her kids. I think I would be great to pass the tradition on. 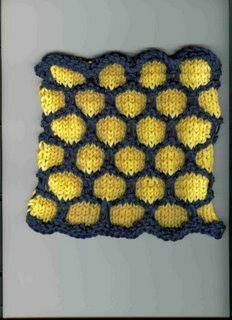 It would also be neat to use this group to pass on some other nostalgic knitting patterns so they aren't lost. Thanks everyone for bearing with me as I make this a public post. P.S. Today I sent the white baby kimono, booties, and hat (along with a six pack of good old Pennsylvania Dutch Whoopie Pies) to my cousin!!! You should have seen the looks on the UPS Store personnels' faces when I showed them the contents of the package!! She has caught the bug too. 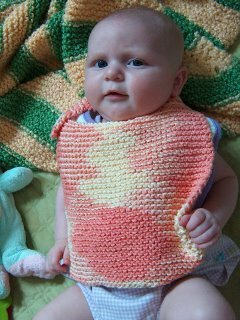 This is her first project done completely by herself (including yarn choice. I love it! It is hanging in my kitchen right now! 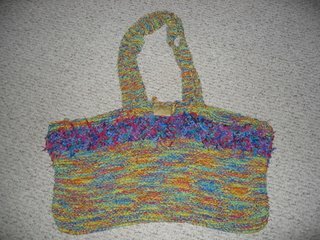 Hello all, I have finally finished that darn beach bag. 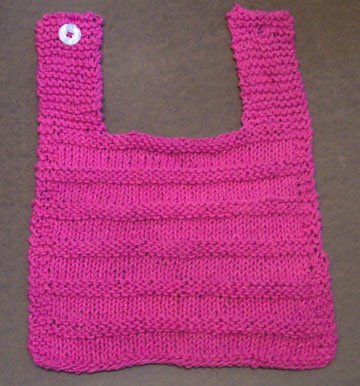 Needless to say, since I had to buy additional yarn, I took a few liberties...added the button and a loop to close the bag, and inside, a handy-dandy cell phone pocket. Let the mitering begin....just hope I can figure it out. Gave away my very first baby bibs today to my friend that also cuts my hair. Everyone at the salon was coming over to check out the bibs and loved them. My friend was so happy she teared up and told "they are to pretty to use. I'm going to have to hang them on the wall in the nursery" and hugged me four times. I must have heard "you made these?!" about 12 times. What fun it was to give them away. 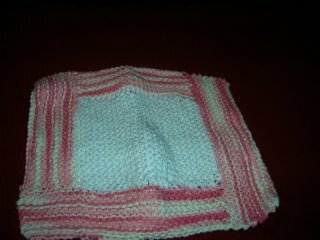 The other photo is of my two day old Absorba project. Can hardly believe just how fast this bath mat knits up. Using 4 balls of Sugar N Creme in the worsted weight. Just couldn't wait to order the double worsted! I have the Mason-Dixon bug!!!! I am so in love with this book!!! Thank you Ann and Kay!!! I want to make 1000 of everything and I can't wait to see book #2. There is going to be a book #2, right? Ann? Kay? I have on the needles a log cabin blanket. I am using all different shades of blue from Brown Sheep in the cotton fleece line. It is so soft and cuddly. 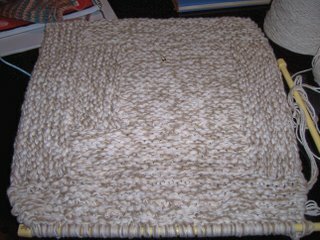 I'm also making the log cabin bath mat, but it has occurred to me that I did not purchase double worsted Peaches & Cream. I will instead use this one for in front of my kitchen sink and purchase the double worsted at another time. 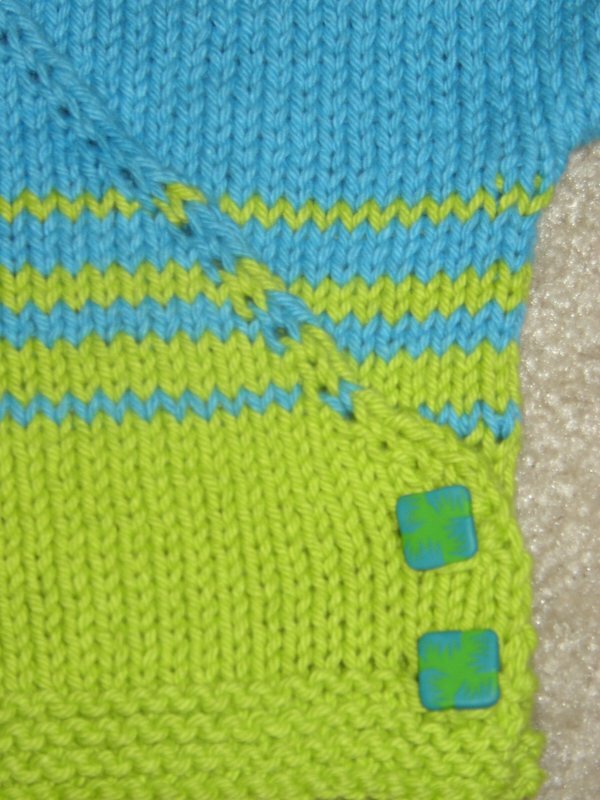 I wish I could knit faster!!! 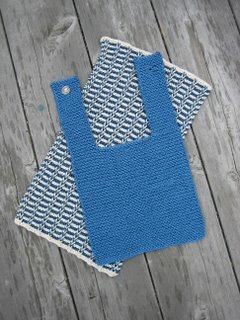 I love seeing what everyone has been knitting and it's been very inspiring. Once all of this is completed, I'm going to make my way into the world of miters. 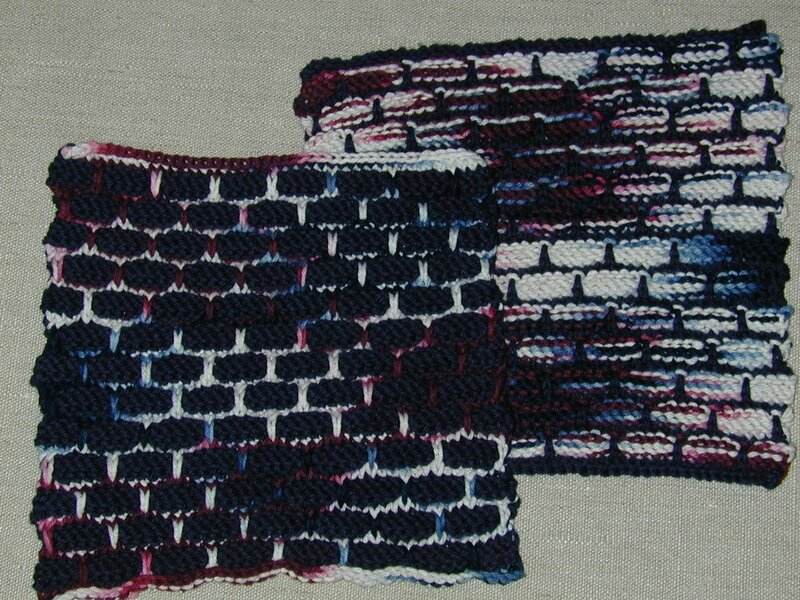 Okay, so I've mastered the warshcloth, but I'm having trouble with the reloaded, circular version. Any advice to make the bobbles look similar to the photos? I love how they look like almost like an loop around the edge. Mine come out looking quite nasty. Big loops of yarn flying out from all directions. 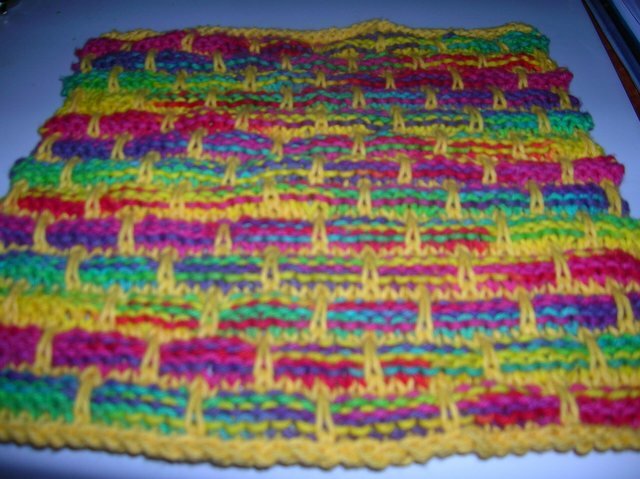 I just trashed my second attempt at this washcloth, and really want to make one well! 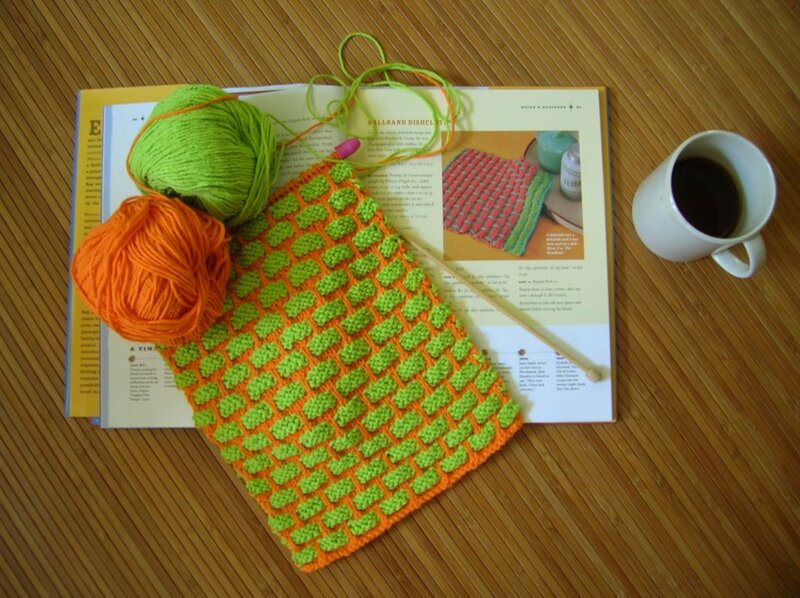 I just got my book yesterday, and I want to do the Log Cabin blanket, but I'm stuck. 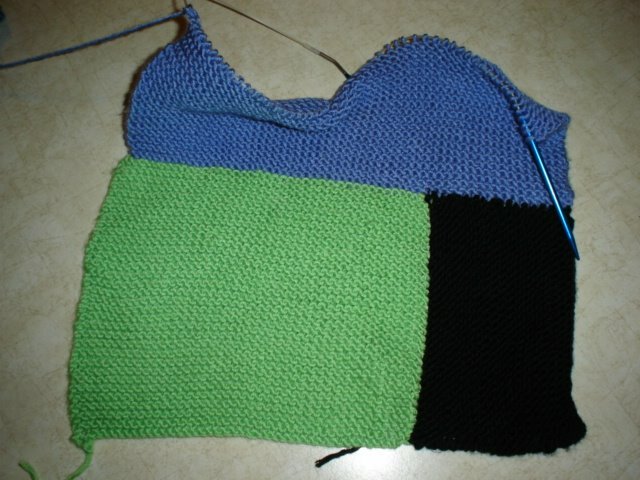 My middle square is knitted, but now I'm not sure if I'm supposed to pick up the stitches in that color, or start the next color. It seems like I should start the next one, but then what do I do with that loop hanging there from the first color? Won't it stick out if I have a loop there that doesn't match the others? Thanks for your help! This is my first post. 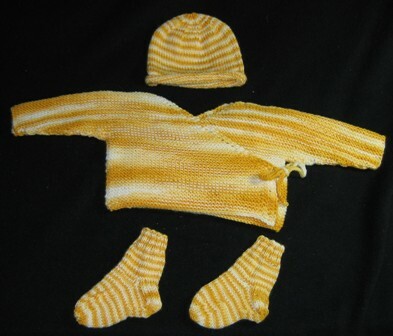 My first project from the book was the baby kimono. I used Sugar and Cream and made matching polymer clay buttons instead of the ribbon. I have also made a few dishclothes and I'm sure I will be making more. 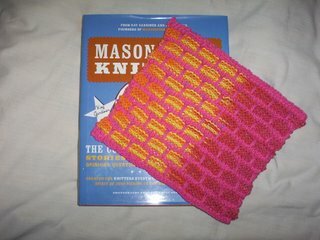 Before the book came out, I discovered the mitered squares on the Mason-Dixon blog and knew I had to make some. 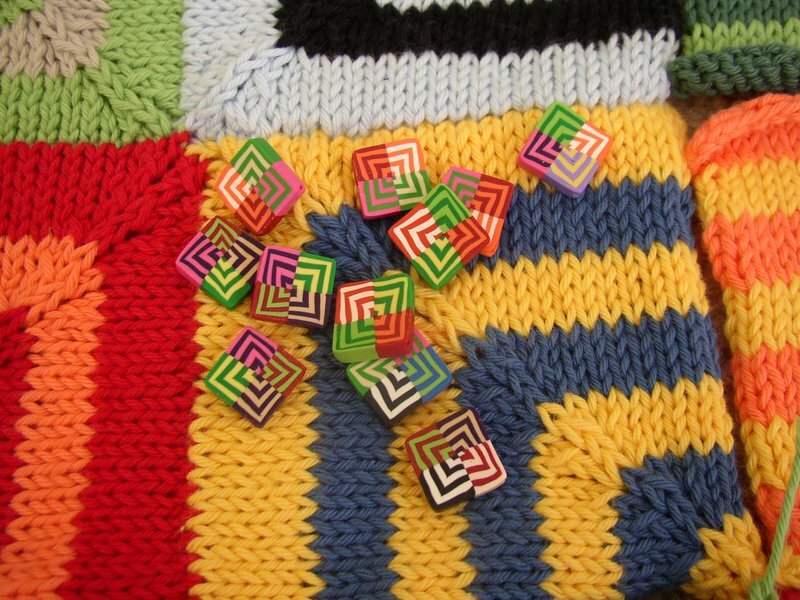 But before I picked up my knitting needles, I started making the little squares in polymer clay and couldn't stop. 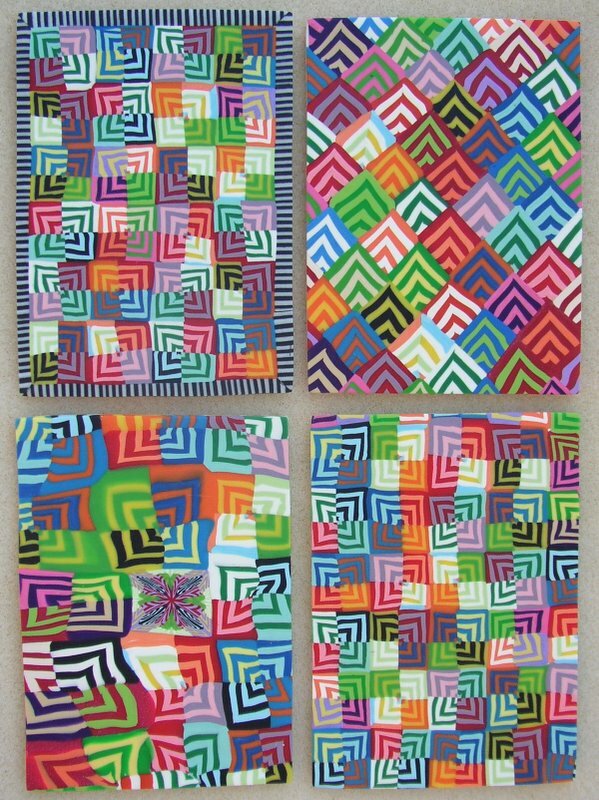 I have had so much fun with these little squares. 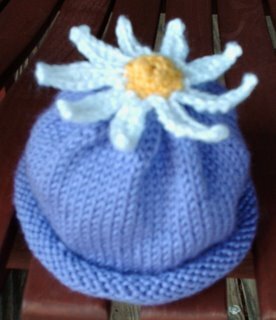 I have also been knitting them every chance I get which usually is either at the pool or car knitting. 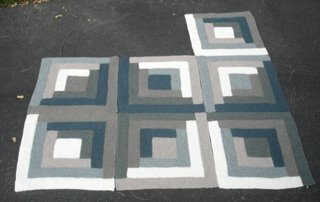 My finished mitered squares so far. 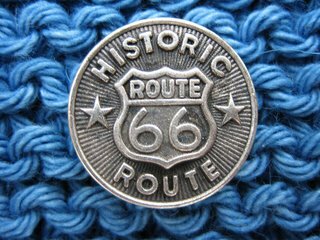 I am knitting the small version (cast on 48). 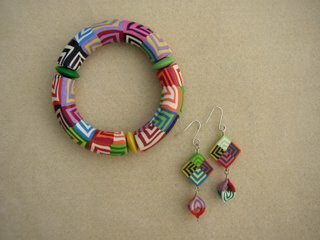 And some of the polymer clay mitered square beads which have become stitch markers and earrings. I also made some ATC's (Artist Trading Cards - 2 1/2 x 3 1/2 inches) for a polymer clay swap. And a bangle and earrings for myself. I started an Absorba bathmat today and love how quickly it is knitting up. It is for a birthday gift next week and then I will start one for myself. I am wondering what else I need to do to make this photo less interesting, and I'm coming up with: not much. All the artfully arranged photos of the beautiful FOs people are posting is so wonderful and inspiring (special mention to the lime green and orange warshcloth post below), but for me, taking a picture is akin to my morning hygiene routine: five minutes to soap up, rinse off, get dressed, and let my hair dry in the whirlwind of my day. However plainly featured, you can all see this is an interpretation of the MD bib. This particular project was knit with some Blue Sky cotton leftovers I had laying around the house (which I do not recommend as a first choice for this project since you will NEVAH find it for 99 cents a skein) and embellished with some knitted flowers ala Nicky Epstein. If anyone wants particulars (colors, gauge. etc. ), let me know. I think I was one of the first people to join this KAL and this is my first post. And it's not even a Finished Object! 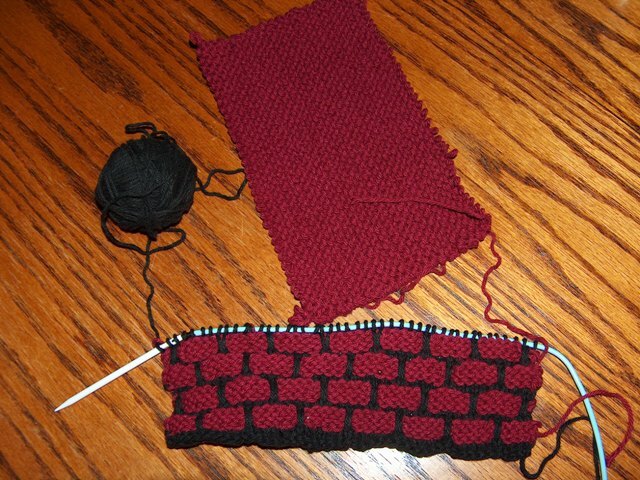 Anyway, I dig my ball-band cloth so much I'm turning it into a towel. 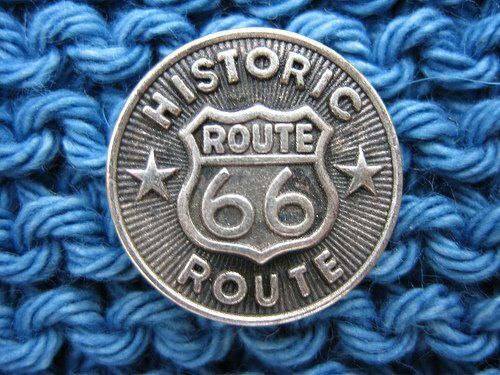 I'm going to keep knitting until it's the perfect size to hang in the refrigerator door handle. I am so inspired by everyone's work! This KAL is great! Thank you for your patience with the swap idea. 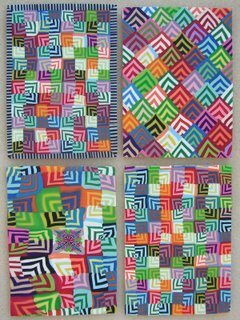 Please contact me privately on my Blog using the Email Me button and I will get back to y'all away from the high traffic of the KAL : ) I'm excited about a fun way to add variety to our warshcloth lives without having to resort to more stashing and hoarding. 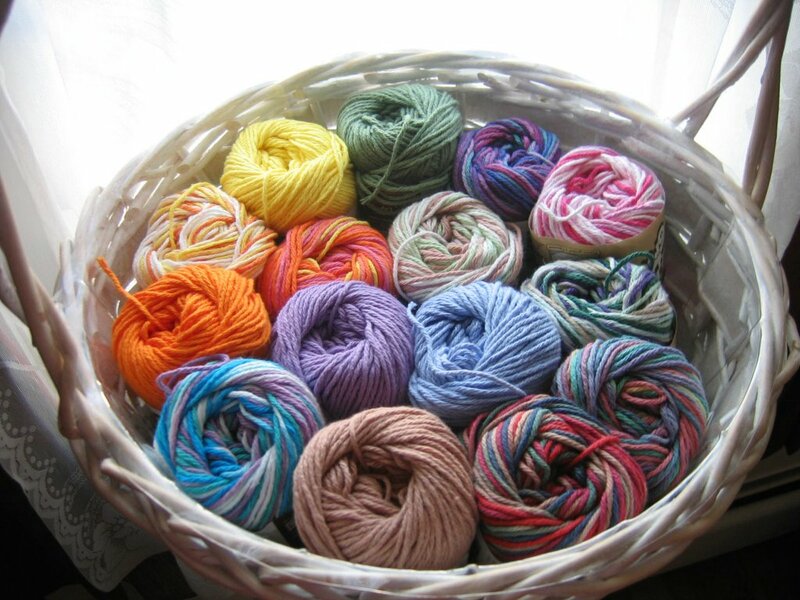 I think my husband will be relieved to see yarn leaving the house, and of course, I don't plan to let him see it come in. BTW...very interested in finding enough "jellybean" colour to make at least one warshcloth if anyone is willing to swap. I am sorry all, but I need to VENT big time....I cannot seem to finish my current project (so that I may start on the mitered square blanket project) as I keep running out of yarn. This is not a MDK project, so I won't post a picture. This is the beach bag from (you know where). I have followed the pattern from the yarn store exactly...yet I had to make 2 yarn runs today...buying an additional 3 skeins of yarn and I have to go back again tomorrow for 1 more skein to be able to finish. uuugggghhhh. 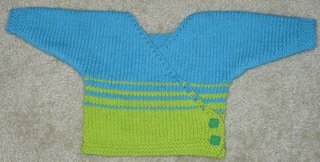 I'm one of those new knitters who just has to experiment - so here is my first Baby Genius Bib - what do y'all think? Honestly, will the ribs catch the food (my kitties don't wear bibs)? 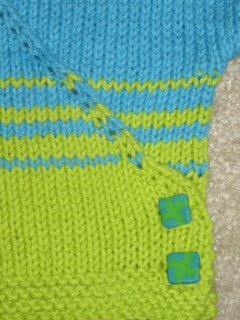 Here's a kimono I did w/ Artyarn sock yarn. 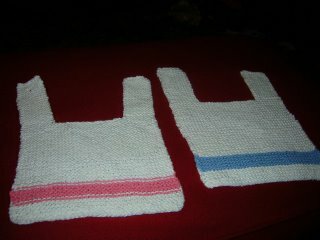 I had to fiddle with the sizing and number of stitches. It looks really small to me but my first grandchild (due in November) won't complain! It's soft as can be. I used a 2 stitch i-cord for the tie because I couldn't find ribbon to go w/ the yarn. 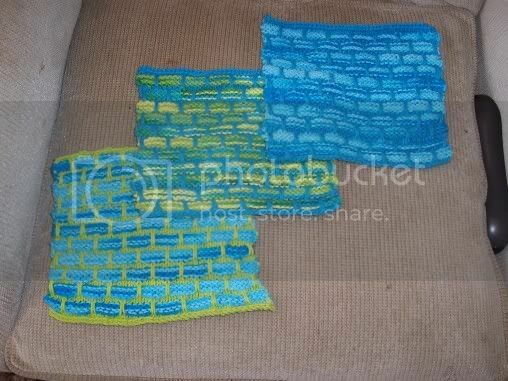 Also two dish cloths. The sides really are straight but they don't look it in the picture because these things are hanging down the side of my sofa! P.S. Spell check wanted to change Artyarn to Earthworm. Doncha love it! 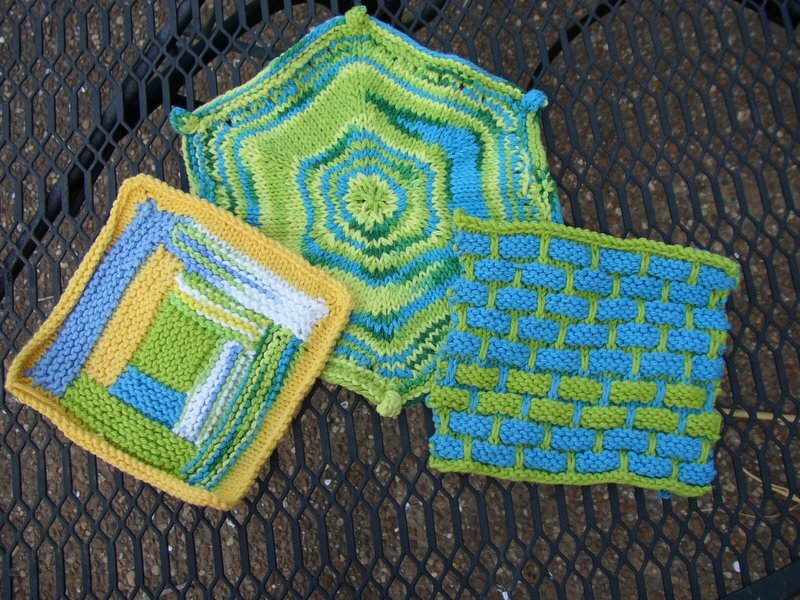 Here are a few more dishcloths to add to the ever-growing number made! For the complete story, go here. Hi all. I am new to this group. The first thing I have to say is what a great book. It has so many good patterns!! From very simple to more advanced, it is for everyone! Here is the linen I purchased for the Moss Grid hand towels. I began them last week but had to frog....I usually am 'right on' gauge-wise but the 5's seemed too loose for may taste, maybe it is just a linen-thing. Did anyone else find it looked better with a 4? 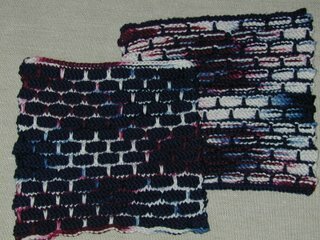 I have never worked with linen before...does the stitch definition tighten up when washed? Would love to know before I start off with the 4's. I am very inspired with all the photos in this KAL and cannot wait to add some finished photos of my own! There are some things in this life that I just seem to have trouble 'getting'. Is it Capitol or Capital when speaking of DC? Just exactly why to lamps light up when you flick a switch all the way across the room? 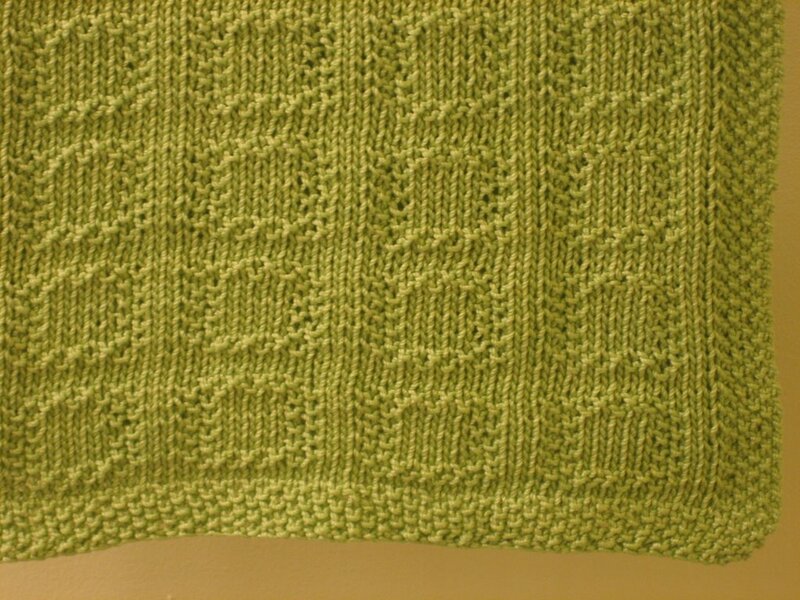 How do you tell the right side from the wrong side of knitting? The definition I've found ("The side the public sees.") is just a tad too ambiguous for my orderly brain. 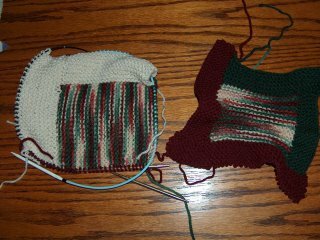 I haven't knitted a lot of items that require knowing the right side from the wrong side but here I am, struggling through the beginnings of my log cabin. I had no problems ripping out the center square FIVE times to get it just the size I wanted but now I'm going crazy. Here are my issues and I'm praying someone can help me understand! 1) I was under the impression that an easy way tell the right side is by seeing where the cast-on tail is. Bottom left of the work, correct? 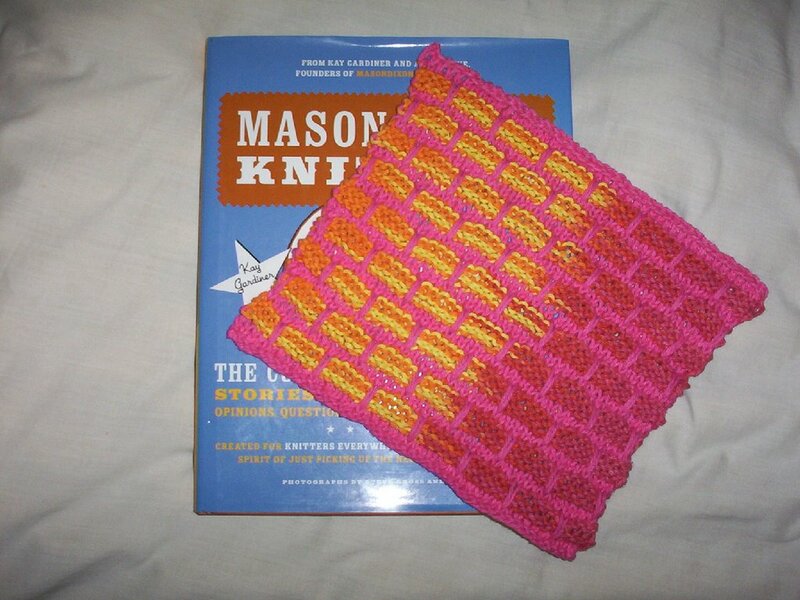 2) The pattern in the book says to always cast off on the right side of the work. I see that and think "Right side (ie: tail on bottom left of square) facing me as I cast off." This now leaves the the cast on AND cast off tail on the same side. 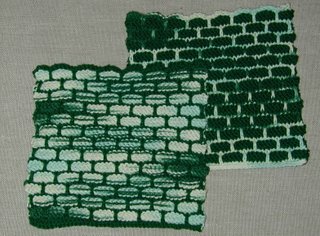 3) Assuming all of the above is correct, I now take the right hand needle, with the right side facing me, and pick up one stitch from each garter ridge (the last stitch of the cast off is the first stitch on the needle). 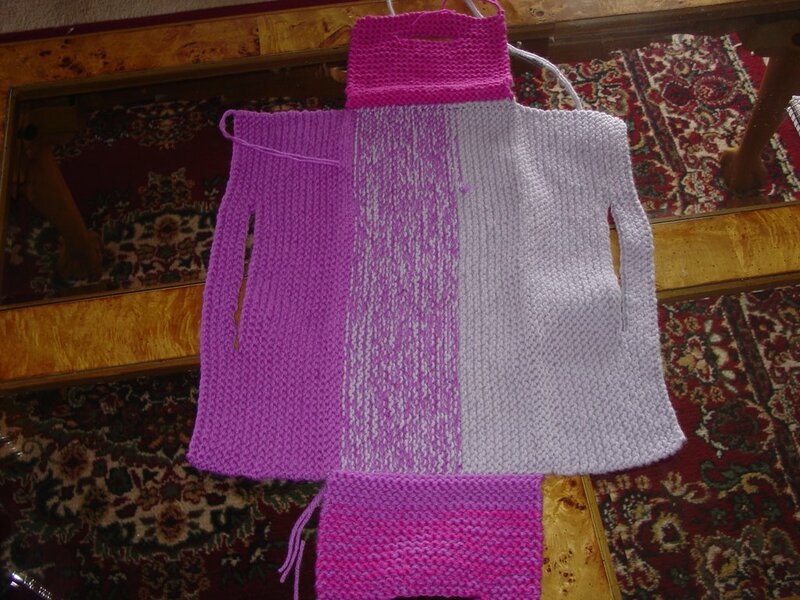 4) To knit this, I then turn the knitting around so the WS is facing me. If I do this, though, the new color's tail is on the righthand side (if RS facing) which, according to the above 'rule' is incorrect. Or does it not matter since the new color is not really cast on? 5) Let's just assume all of the above is correct. 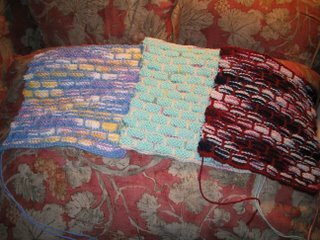 What I have now, with the new color row knitted, are stitches on the RS connecting the 1st & 2nd colors that are all stretched. I tried picking up on the other side of the ridge but that just created a weird bump on the RS. I'm just picking up the easiest stitch on each ridge which is on the WS of the ridge. But to pick up sts on the RS, I have to pick up a full st in from the edge. ARRGH! I'm thinking this last step is my real problem. I don't mind the "quilted" look of the WS but would really prefer a nice tight connection on the RS. Suggestions? Advice? Straightjacket? Thanks! Hi. This is my first post here. I love love love the book, and bet I have flipped through or read it 10 times. 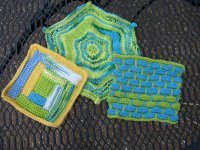 Mostly I've been working on dishcloths, but can't wait to start some log cabin stuff. My MIL was here visiting over the weekend and requested "One of Everything" from the book. Perhaps I should get busy?? 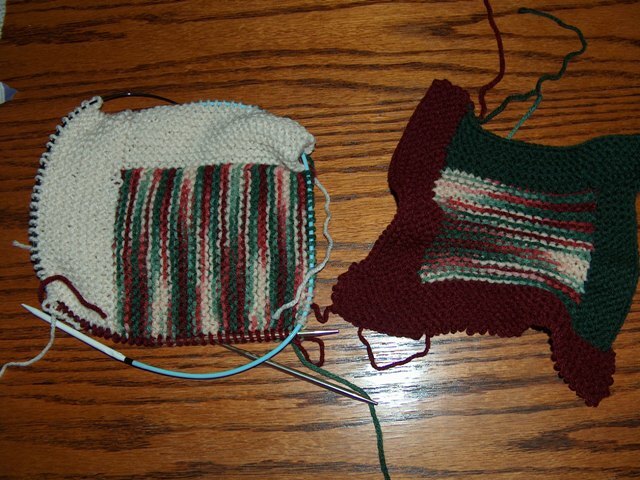 Yarn forward, Yarn back...what the heck?! I just finished my first felted box from some yarn I had in my stash. I wanted my box to be longer and more like a rectangle so I changed the dimensions a bit. Next time, I'll think I'll shorten it up and make it more square to add stability. I'm going to be doing two absorbas I think. Meantime, I have many more washrags in the works! I asked for prayers a few days ago, as the Baby Kimono pattern looked much more intimidating than I thought. 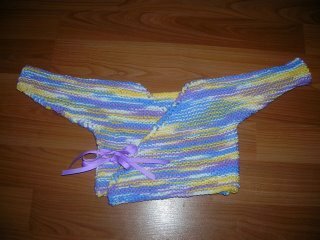 Well, knitters' prayers clearly work, 'cause here is a completed kimono for my coworker's soon to be new arrival! Anyway, here's a picture of my finished product! P.S. In case anyone is wondering why I chose these apparently random colors, I'll re-post that I'm want to have a nursery (one day!) decorated in black and white toile with accents of other black and white patterns and apple green. 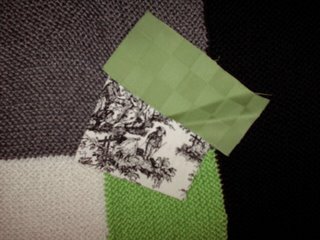 Here's a previously posted picture of my blanket with fabric swatches to better illustrate my intent. 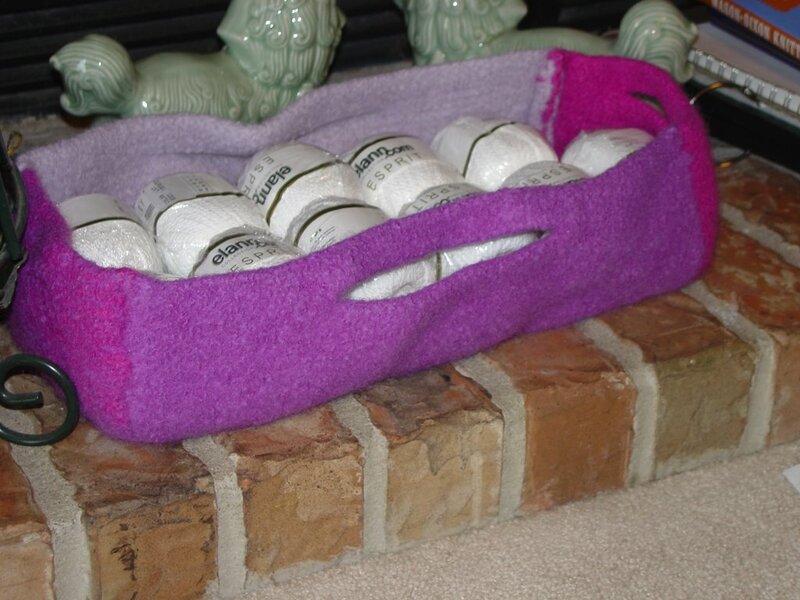 The give-everyone-a-washcloth bug has bit! 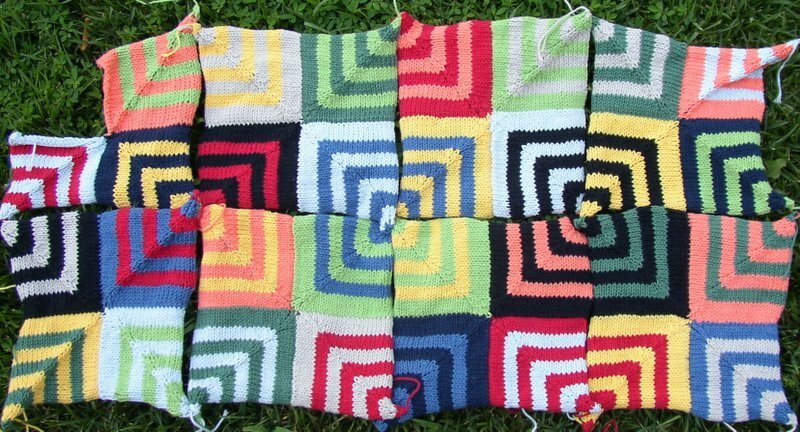 I'm tentatively planning an afghan consisting of 9 squares, probably about 12" each, alternating between all four methods. What do you think? I have a whole bunch of dk-weight wool-blend yarn in 12 colors that I got in Russia for a different project, now abandoned. Is anyone else thinking along similar lines? Anyone tried combining the different kinds of log cabin in separate afghan squares? Been lurking here since I bought the book. 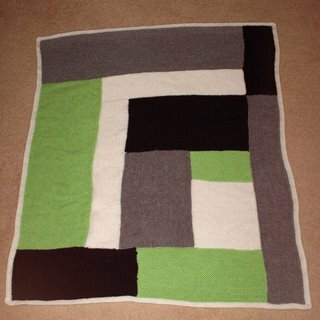 This is my first fo to share though. 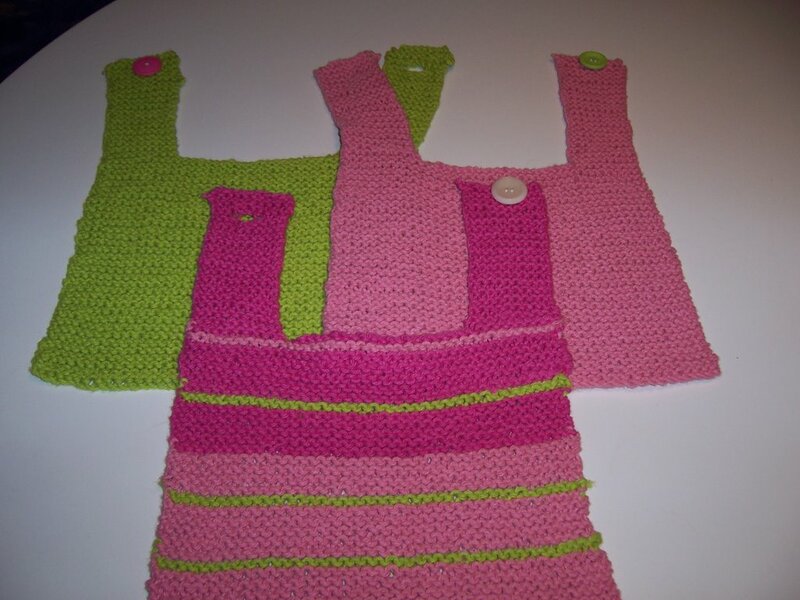 I've made a bunch of dishclothes (I'm sure there's something addicting in that pattern) and given them away before I even got a picture. 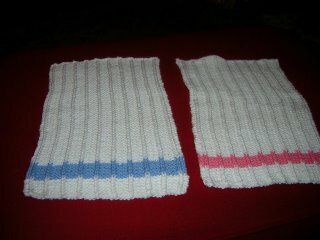 Lately, I've been knitting for twins. My sister's coworker is having boy/girl twins. What fun! Baby Genius burp clothes. The consensus at the shower was to NOT let them spit up on these! Too funny. 2 sleeveless baby kimonos. We live in Florida, where it's likely to be darn hot for awhile after these 2 are born. A log cabin washrag. Not for the twins. My neice claimed it! 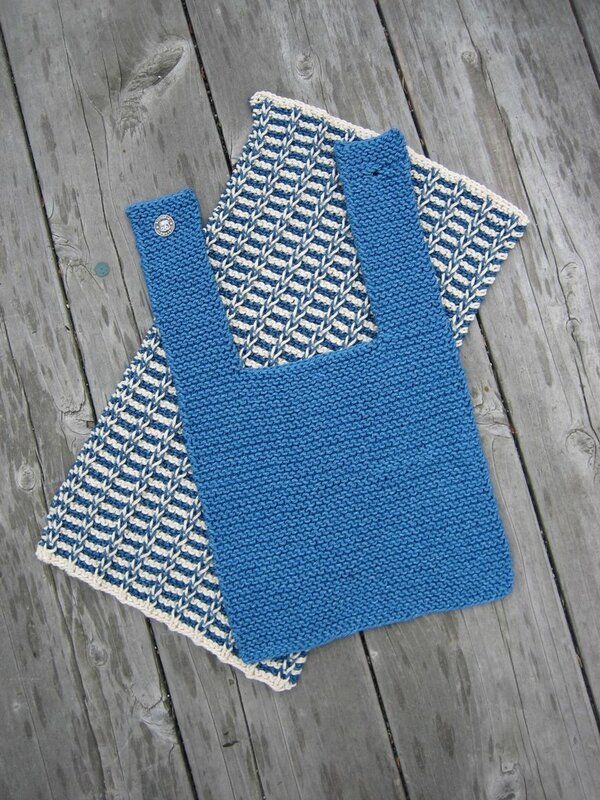 Love seeing all your projects from the book! I am new to this KAL but I have been enjoying everyones posts and ideas. My friend showed my the book last wed the 21st, and by the next day I had a bib done and the log cabin started. Of course I finally bought the book then on the 25th after doing two bib and still working on the log cabin. For the log cabin pattern I had remember the numbers 20, 24, and 9 -- what I forgot is that they were counting ridges and not rows (well no wonder I was having problems.) Since I bought the book I have started the ballband washcloth(2 of them - one is a row from being done) and I am planning the modern baby log cabin with left over yarn from some outfits I made for my daughter. 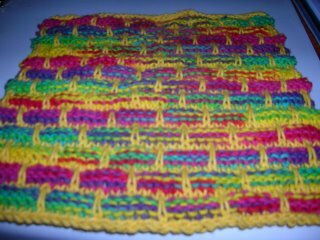 I LOVE the patterns because they are easy enough to do while I am watching my 3 1/2 month old!! Pictured below are my second ballband (the colors look better in person and I am reknitting from something I didn't like), the log cabin being REKNITTED because of the brain fart, and my second baby bib doing it the long strap way and my adorable model Katie.